Alert: This is not a real kitchen makeover. No cabinets, floors, appliances or counter tops have been changed. This is just how I made my 10′ x 10′ kitchen work a little bit more for me and a little less against me. When we moved into the house, the people who moved out left a few items behind that “conveyed.” Normally this isn’t stuff you want, but in our case it was. In the kitchen this included some IKEA rods, a metal shelf, and a wooden cart. I put some spices and other baking goods and some plants on the rods with the help of two of these and three of these and I used the shelf and cart for miscellaneous storage. This worked fine until last fall when we got married and were gifted with all.of.the.things. I LOVE each and every wedding gift we received and I use them. But finding a place for them that was handy meant I needed to start using the space I have more efficiently. So I thought about it for awhile, moved some small things around, and started to come up with a plan. This past weekend, the plan became action. Pardon the mess, I was making breakfast. 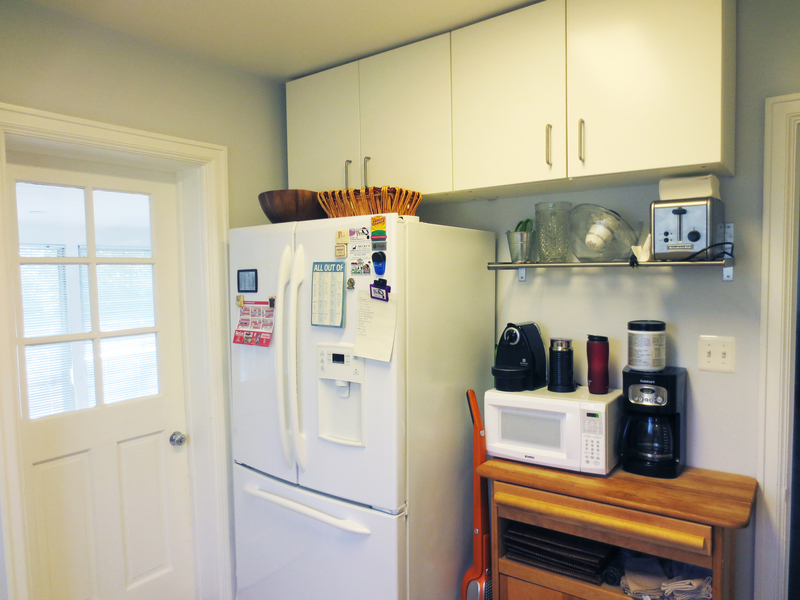 Here’s what one side of my kitchen looked like before. See the wall of plants and spices? Their hours are numbered. 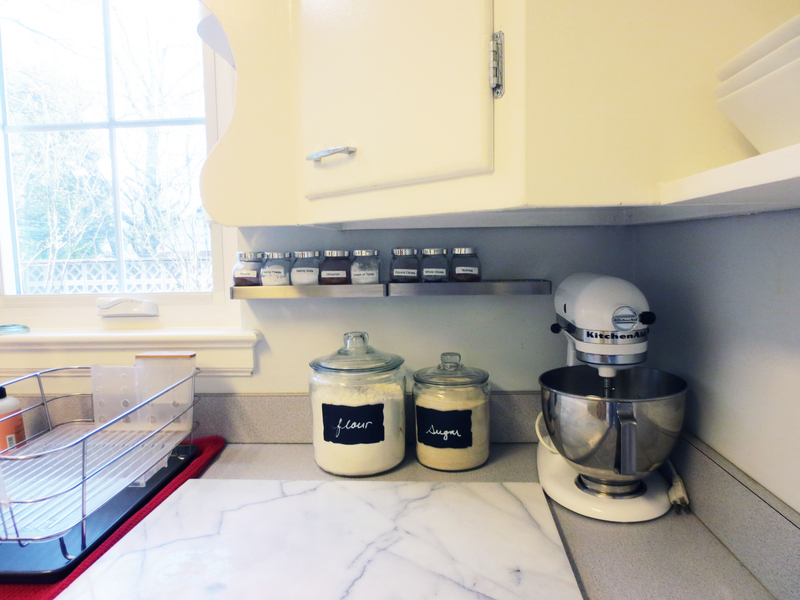 I realized that while having the racks with all my baking spices and other ingredients so close to my “baking station” was convenient, I actually had room in other just as convenient areas for everything those shelves were holding. What I needed was more heavy duty storage for things bowls, pots and pans. So Mark and I tag teamed this little project. 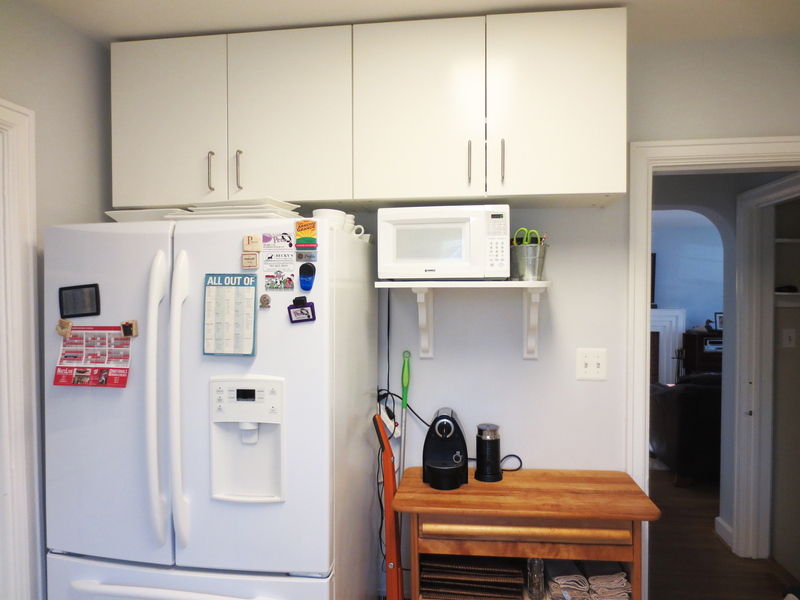 For these two shelves, we bought (2) 1″ x 8″ pine boards from Home Depot and cut them to the length desired. Then to create a rounded edge, Mark took the width of the board (7 1/4 inches) and measured that in from the end of the board. Using a string and a pencil, he held one end of the string to his mark 7 1/4 inches away from the edge and the other end, with the pencil, to the edge then swung it towards him creating a quarter round. Here’s a diagram. He used his jigsaw with a regular wood blade to shave off the extra and create the curve. He made two of these and supported them with these corbels from Home Depot. I painted everything white and here’s what they look like now. So much better, yes? Also I think these go with the existing, original cabinets much better than the stainless steel ones. 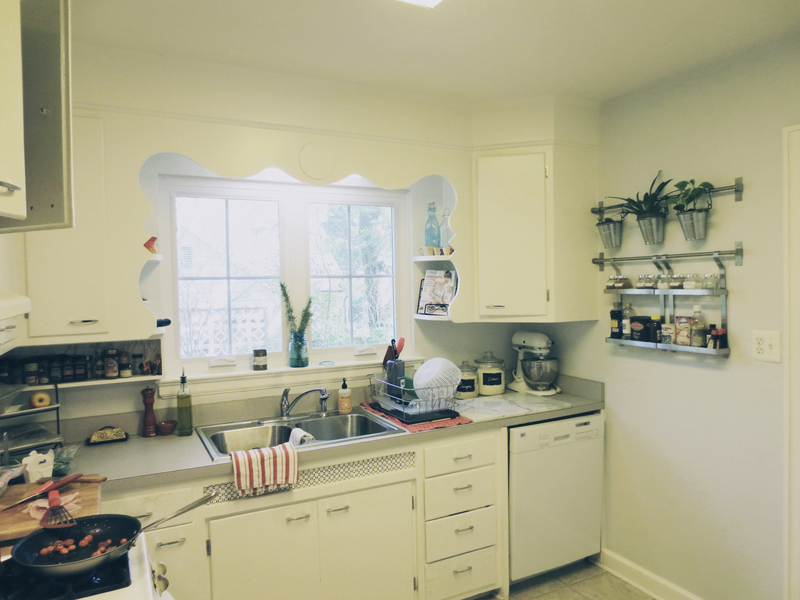 I moved some of the larger items that were on the shelves to a space I created in the pantry and then attached two of the spice shelves to the wall behind my baking station. Since I have a built-in space shelf on the other side of the sink as well, it keeps my cooking and baking stations looking symmetrical. Here’s my baking station now. Honestly, I don’t know how I lived with such clutter. Probably because I use the things in this photo alot and decided that easy access was more important than aesthetics But now that I have seen the way and the light, I know I can have both. On this side, we decided to replace the metal IKEA shelf with one that could support our microwave in order to get it off of the cart and create more surface space. Mark cut (1) 1″ x 6″ and (1) 1″ x 10″ pine board to the desired length and then screwed them together to make a shelf that was 16″ deep. Again, he created a rounded edge to match the rest of the shelves. 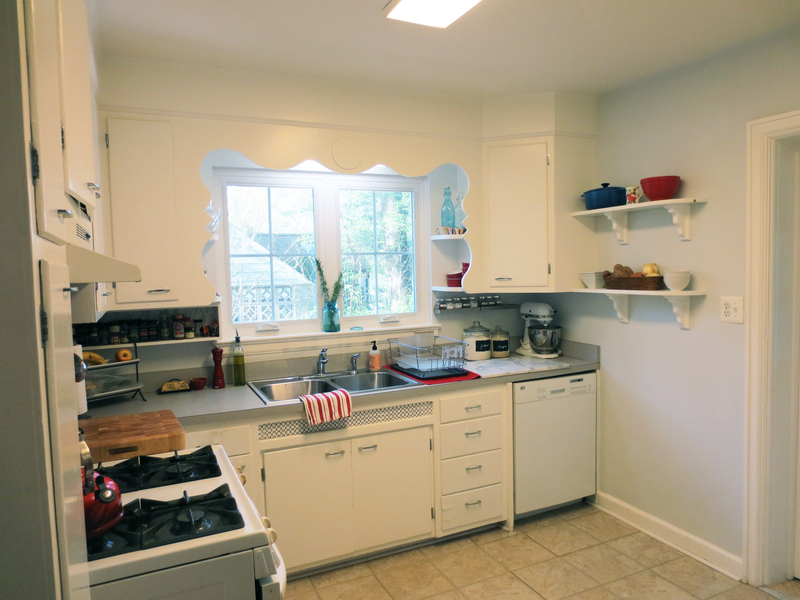 I painted the board white and supported it with these slightly larger matching corbels. We measured so that the shelf would sit just low enough to accommodate our microwave (also a wedding gift) and then screwed it into place. Here’s how it turned out. Look at all that space! I made room for the napkins in the drawer in the cart and I took the coffee maker, glass pitcher, salad spinner, and toaster and put them in the cabinets above the microwave. Now it wasn’t like those cabinets were empty before. They held alot of white bowls and platters that I use for serving. But after moving some of the bowls to the other new shelves and getting rid of the ugly brown bowls and baskets on top of the fridge, I realized that everything else that had been in those cabinets could fit on top of the fridge and NOT block the cabinet doors above them BONUS! Now not only are they still conveniently located for easy use, but since they are all white, they blend in with the fridge and don’t look so cluttered, leaving the cabinets free to fill up with all the ugly stuff DOUBLE, TRIPLE BONUS! So now the only question that remains is whether to also paint the wood cart. At first I was totally convinced it needed to be white as well, but Mark wasn’t so sure so we agreed to leave it for now and think about it. What do you guys think? Should we paint it white? Black? Another color or leave it be? Please let us know your thoughts! So that’s it for this little mini makeover. I’ll be back later this week with a yard update, we’re almost there!